A dolphin born in an aquarium in the Netherlands is to be named by the public. 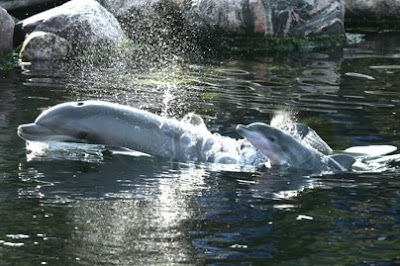 As these amazing photos show his mother Finagain gave birth in her pool in the Harderwijk Dolfinarium on the 22nd May. Finagain, a common bottlenose dolphin, was herself born in captivity to Notchfin and Guy in 1992. Her pregnancy lasted twelve months, and the as-yet unnamed calf is around 3ft long at birth, already fully capable of swimming. 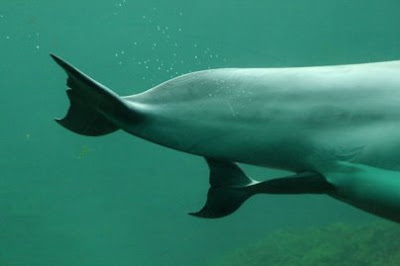 Unlike human babies dolphin calves are born “breech”, i.e. tail first. It will live with its mother until it is six. Male dolphins become sexually mature around age nine to thirteen. The Dolfinarium is home to sixteen dolphins and six harbour porpoise. As well as hosting dolphin displays it acts as a rehabilitation centre, taking in beached or injured cetaceans and preparing them for life back in the wild. It was first opened in 1965 by Frits den Herder and his brother Coen. During its chequered history the park went bankrupt after an ill-advised expansion into other European countries. Only a state intervention by the Dutch government restored it to the not-for-profit animal rehabilitation centre it is today.